Electronic logs are taking fuzzy math out of trucking. Federal and state officials have given truckers until December to install electronic monitors that track their time on the road. The new devices are meant to make highways safer by keeping drivers from overshooting the hours they are supposed to drive. But some truckers who get paid by the mile could see their incomes drop with a more accurate accounting of the time it took them to make a delivery. And lower pay could exacerbate a driver shortage in an industry with a reputation for high turnover. “You’ll see smaller carriers leave the business,” said Rod Nofziger, chief operating officer for the Missouri-based Owner-Operator Independent Drivers Association, which has 158,000 members. Since 2003, truckers have been limited to 11 hours of driving during a 14-hour on-duty stretch. Waiting at a loading dock or getting stuck in traffic counts against that time. That tempts truckers to say in their logs that deliveries happened faster than they did. 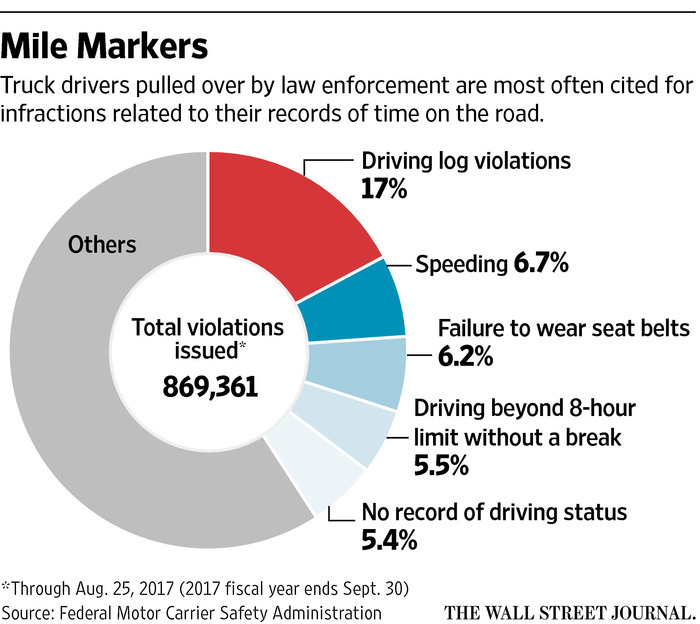 Driving-log violations are the largest share of citations that police issue during truck inspections, the Federal Motor Carrier Safety Administration says. Even modest fudging can add up to hundreds of hours of unlawful driving. Road-safety advocates say off-book driving pushes up highway accident rates. The motor-safety agency estimates electronic logs will save 26 lives and prevent 562 injuries annually. “The only reason anyone would oppose this technology is to skirt the hours of service,” said Chris Spear, chief executive of the American Trucking Associations in Virginia. Some smaller companies that operate just a few trucks and independent drivers are resisting the switch. “I don’t plan on it until the last minute,” said Monte Wiederhold, president of B.L. Reever Transport Inc., a six-truck fleet in Ohio. He and other smaller fleet operators say allegations of cheating on paper logs are exaggerated and the safety benefits overstated. With drivers paid an average of 40 cents a mile, small operators say the $1,000 cost for an electronic log and the monthly service fees of around $40 per truck to process the data is a financial burden. Small fleets and owner operators account for about half of the 1 million heavy-duty trucks for-hire in the U.S. Acknowledging those concerns, the consortium of state and federal law enforcement agencies overseeing the change said last month that they will fine truckers found without electronic logs starting in December but won’t force their trucks off the road until April. Fines for log violations are based on state statutes and vary from state to state. Paul Truman, president of Truline Corp., a larger trucking company in Las Vegas, has seen a 12% drop in weekly miles traveled since most of the company’s 220 trucks were converted to electronic logs. He says he hopes the reduction will be offset by higher shipping rates if there is less off-log driving and some owner-operators leave the industry.